Fashion is the most immediate and intimate form of self-expression. Faster than anything else, what we wear tells the story of who we are - or who we want to be. Yet even as fashion touches the lives of each and every one of us, it can seem mysterious. 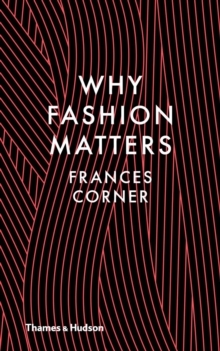 Who better to guide readers into the dizzying world of fashion than Frances Corner, Head of London College of Fashion and a leading expert on this rapidly expanding, increasingly global, always exciting industry? In 101 provocative entries Corner teases out the glorious intricacies and contradictions of an industry that simultaneously values technology and craft, timeless style and fast fashion, the bespoke and the mass-market, consumption and sustainability, cold-hard numbers and creative expression. From `Karl Lagerfeld and High-Tech Fur' to `The White Shirt' to `The One Trillion Dollar Business', each entry offers a unique avenue into fashion and its impact, both positive and negative, on lives around the globe. Accessible, instructive and hugely enjoyable, this book will be essential reading for anyone involved in fashion, business, education and beyond.